Two men have appeared in court charged with stealing money from a cash-in-transit van at gunpoint in County Londonderry. Alan Carroll, 37, from Island Key, Dublin, and Darren Redmond, 24, of Caledon Road, Dublin, are both charged with robbing a security firm of money. They are also charged with possessing a firearm with intent to commit robbery. 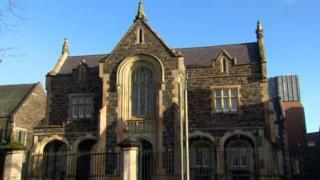 The men appeared at Ballymena Magistrates' Court on Monday. A police officer told the court she could connect the men to the charges. The court was told two security guards were refilling a cash machine in Greysteel on Saturday afternoon when they were approached by two men wearing what were described as "old men masks". One of the guards was pushed inside the cash machine facility and a "gun held to the head" of the other guard, the court was told. Mr Carroll is also accused of using a mobile phone while driving and using a vehicle without insurance or MOT in the Foyle Bridge area of Londonderry. Mr Redmond is also accused of possessing cannabis. Both have been remanded in custody.